Why do so many followers fail? Reading some of the threads on the Zulutrade forum there is one common question that keeps coming up again and again. Can I make money here? And if so, how? This isn’t something just asked by newbies, and people with no investment or trading experienced. It’s asked by experienced investors as well. And it’s not surprising. If you check out the followers’ pages on Zulutrade, its clear that the losers massively outnumber the winners. Not all followers allow their profiles to be viewed publicly. However a good many do. If this group is “typical”, and there’s no reason why it shouldn’t be, by rough calculations then about 95% of investors lose some or all of their money. If you check out the followers’ pages on Zulutrade, its clear that the losers massively outnumber the winners. Of course that holy grail of a signal provider that never loses is “fools gold”. This is why the above cycle is repeated over again until the investor either loses all of their funds or learns to expose their account to less risk. Making money in forex isn’t easy. If it were, masses of people would be giving up their day jobs and sitting at home all day whilst the market earns their keep for them. That doesn’t happen. As nearly all investors have such a predictable pattern of losses, it makes sense that profitable counter-strategies must exist that lead to gains where there are losses. Whether you’re trading yourself, or investing in others, achieving consistent, positive returns in the markets is a very tough nut to crack. We’ve touched on this in other articles on forexop (see more). The only ones making money for sure are those who don’t take on any risk at all – the brokers. However, as nearly all investors have such a predictable pattern of losses, it makes sense that profitable counter-strategies must exist that lead to gains where there are losses. This article talks about common reasons for losses on Zulutrade, how to avoid them, but more importantly, how to profit from them. The number one reason why investors lose out, and SPs don’t is that investors tend to over-leverage. This forces them to “abandon ship” during big drawdowns. Often this is at the worst possible point. A capitulation in the market – just before a major trend reversal takes place. For this reason it’s vital that you anticipate these normal events and make sure you’re not caught out. Make sure you’re not leveraging at excessive risk levels. A good rule of thumb is to add-up the worst drawdowns of all of your signals providers, then multiply this number by two. This will give you your very worst case scenario. You should be able to suffer that loss on your account and still continue with your investment plan – without a margin call, and without significant difficulties. Many signal providers are using similar Expert Advisors and using similar trading styles. If you’re following a group of providers, you could be far more exposed than you think! In the currency markets, worst case scenarios tend to happen much more frequently than people realize. Not only that, many signal providers are using similar Expert Advisors and using similar trading styles. If you’re following a group of providers, you could be far more exposed than you think! Make sure you understand the correlations between currency pairs. For example, EURUSD and GBPUSD have strong positive correlation, while AUDUSD and USDCAD tend to be negatively correlated. If your traders are primarily using the same strategy, but on a correlated pair, you are in effect doubling-up on your exposure. Use this free Metatrader tool to check correlations between the instruments being traded and whether or not they are properly diversified. If they are not diversified, use your trade settings to reduce exposure accordingly or avoid the signal provider altogether. Not all of these are still trading. When grid trading is done correctly it should actually reduce risk. But oftentimes the technique is used to multiply exposure thus generating profit from unnecessary turnover. This kind of grid trading is extremely risky. Especially for the smaller investor, who isn’t able to tolerate frequent and deep drawdowns. When you’re following a trader with this kind of strategy, their decisions can seem reckless and make no sense. Especially when the market is trending strongly against their positions. You need strong nerve and deep pockets to follow this type of signal. Reversal-strategies If so many people lose money on Zulutrade, then why not do the exact opposite of what they do? In effect, you become their counterparty. Zulutrade has the tools for you to do this very easily. The “reverse” switch is a available in the advanced settings screen. When you follow a trader in reverse, their buy signals become your sell signals, and their sell signals become your buy signals. A reversal-strategy is not appropriate for all signal providers. If you find yourself too emotionally attached to the swings and movements in the markets, you’re probably investing way beyond your financial means. But these are interspersed with deep and devastating drawdowns because their high win-ratio is unsustainable in the long-run. This is the so-called Taleb or fat tail problem. See this real simulation (opens in new window). In fact by connecting to many such SPs at once, followers are inadvertently fast-forwarding the result of this simulation. Keep in mind that when investing real money, powerful psychological factors come in to play. Particularly if you’re investing funds which could impact your lifestyle. If you find yourself too emotionally attached to the swings and movements in the markets, you’re probably investing way beyond your financial means. 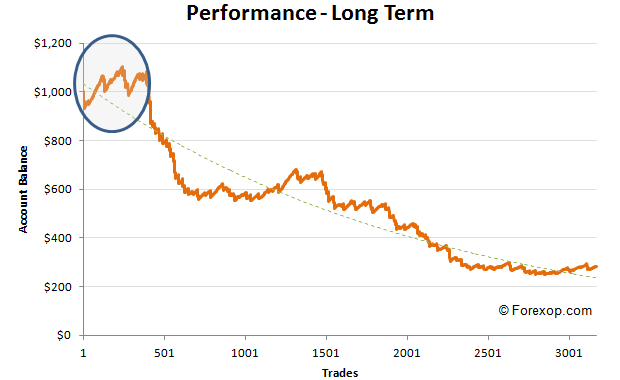 Winning runs rarely last Understand the cyclic nature of trading and survivorship biasing. Be aware that those traders at the top of the rankings may have gotten there by a combination of luck and temporary market conditions. Conditions that simply favor their particular style at that point in time. Unfortunately, once they reach the top of the rankings, this is the point that most investors blindly “pile into” their strategies. Inevitably, the conditions that got them there in the first place change, and their returns suffer as a consequence. Not only that, once a trader achieves high rankings and attracts a significant pool of followers, many of them stick. Even during the bad spells. If you look at the providers who’ve reached the top like F8, Increasing Deposit, Azar Consulting or Kama Spot they still have significant funds following them, despite falling sharply down the ranks. This means the provider has little incentive to improve performance. Beware of “churn and burn” traders Zulutrade’s policy of letting signal providers run on demo accounts is definitely a mixed blessing in my view. One major disadvantage is that it lets unscrupulous ones use a trick known as “churn and burn”. What the “churn and burn” trader does is create a huge number of demo accounts with 3rd party brokers. Sometimes hundreds of them. He or she then runs various expert advisors with slightly different parameters on each account. He then monitors the returns over a few weeks. By the law of averages one or two accounts will perform quite well over this period. Just because, by some fluke, they are suited to the prevailing market. This is not the result of the trader’s skill or the quality of the EA. The other accounts will most probably suffer massive losses. “Churn and burn” trader create huge number of demo accounts with 3rd party brokers. Sometimes hundreds of them. The successful accounts are then connected to Zulutrade and offered to followers. The other demo accounts are thrown away. These “winning” accounts may be profitable for a few weeks before crashing once the prevailing market conditions changes. This is a scam pure and simple. It’s impossible to see who’s doing this, yet its widely accepted in trader circles that it’s going on. Things to watch out for are signal providers having high numbers of “alternative” – or “known as” accounts. Use of publicly available expert advisors: Many of the EAs being used are derived from, or exact copies free advisors which are in the public domain. Many execute simplistic, and highly similar trading behaviors. Stops and limits set from commonly known technical indicators: Fibonacci, Elliot Waves, RSI, Stochastics, Kinko Hyo, Bollinger bands and so on. These indicators all tend to generate mass entry and exit points. Institutional players can easily anticipate and exploit these events – either front-running them or trading against them when the moves have occurred. Dealers are often forced to “take the other side” of the trades in such markets because of their responsibility to maintain liquidity – being heavily positioned against the retail crowd who’re all trading the same direction, they’re then axed to push the quote back in their favor. Trading currency pairs which are highly correlated: Many currency pairs, as well as the crosses have significant correlation that should be taken into account. You often see investors on Zulutrade following dozens of signals a the same time. But this can be costly mistake. When you follow SPs who’re correlated for the above reasons, rather than diversifying you are actually adding to your exposure. And so increasing risk. Don’t follow a large number of providers in the hope of diversifying. Consider increasing your lot sizes on a smaller number of high-quality SPs instead. This way you reduce your overall trade volume and costs. Many investors overlook this fact. When you follow large numbers of providers with small lots, the slippage and spread costs can massively cut into profits. This is worse if the provider’s “average return per trade” is very low. In this case your total costs, as a percentage of profit are much higher. Every new user gets out of that as a scam victim, this time I had a very frustrating experience with zulutrade. I had to chat with a chat executive so called Marina for a simple question and she dragged me into an Insulting issue. Imagine if they are laughing out of customers question, then what would happen if you have deposited? Not only that, most of the chat executives are racists since they know and have your documents, they disrespect and insult the customers based on their race and acoustics. I think the regulators and other professional brokers should not be partnered with them. Not to mention, zulutrade was fined for conducting on many illegal acts. Please search on google for “zulutrade scam review”. At ZuluTrade, we enable our users to automatically follow the trading activity of successful Traders from all over the world and eliminate the influence of emotion on trading. We know that trading involves high risk and that is why we have developed advanced tools to protect our clients’ capital and and features to help them optimize your performance, such as ZuluGuard, Automator, Simulation, Traders’ Combos and many many more! Our goal is to help our clients win ad you can easily see that if you simply try to open a Demo account and test it yourselves in a risk-free environment. And remember that you can get advice and useful information by our Support team, available 24/5 and ready to guide you throughout your journey. Commenting as a signal follower, I noticed today on both my Zulu trade demo and real account, that the losses indicated in my history tab are not reflected by the traders in their Trading History. Was quite stunned. My demo account fell by $1000 yet the traders I was trading with, 4 of them are top 10 ranking today, with only one loss entry each. I thought there was something amiss that’s why I began researching on this – so thank God that I’ve found your page. I’m deleting my account immediately. It sounds like your trades may have got stopped out and the signal provider’s are still open? Why not contact Zulu’s helpdesk first to see if they can help before closing your account? My SPs open trades at very earlier time my trades are opened. Because of this, I got lower Pips than normal. Please what can I do to correct this?? You can check the alternative ranking tool of Zulutrade’s signal providers which I provide, address . Your comments on the ranking system are welcome. Learn the Basic of Forex Trading, Drop Your Whatsapp Number to get Free Signals everyday. OR Register Here …. Comment: What about this signal – surefxsignal @ zulutrade. The reasons for losing are other ones..
All the top signal providers in Zulutrade keep changing because they cant handle the pressure. I recommend to you to visit ddmarkets.com and see what they wrote about them, it made complete sense to me. I had about $60,000 followers balance. My monthly profit was $100. Zulu had made thousands just on comissions. The point? They were not able to pay this 100 bucks after 2 months. So at the beginning of December they still owe me for September trades. I pulled my signal off Zulu for the very same reason. When you look at the way they work out commissions you see why most traders on there are only making pennies if anything at all. Zulu make profit on every trade you do. You only get half pip each trade on live followers and then only if your complete month is in profit. Most of the followers are using demo accounts. Then those with real accounts might not take all your trades. I’ll only do signal share through pamm account broker from now on. At least then I get a percentage of real profits I make. How do you spot Grid traders? These are usually seen as traders with a large number of open positions in one currency pair. Grid trading per se does not need to be risky. But it becomes very risky when overleveraged or when combined with stop loss avoidance techniques such Martingale. What you need to know as a follower is that the Zulutrade rank system puts at the top traders who make Zulutrade money NOT ones who will make you money. My account is up $34K but my ZT profile shows a loss! It ranks traders on PIP amounts not dollar amounts and that is hugely misleading. The ones who do lots of little identical trades are at the top of performance table even when they are losing money. This is how it works…..
That shows on ZT profile as 97% win ratio and profit of 250 pips even when trader has really lost money! 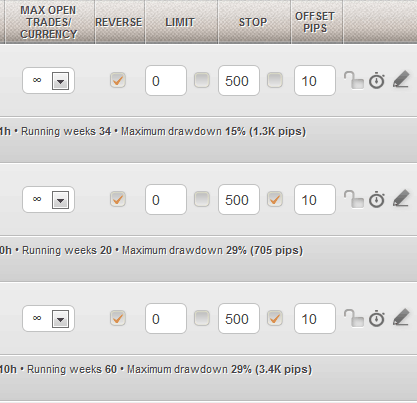 That shows as 50% win ratio and profit of -50 pips. Have complained to ZT before about their ranking system but got nowhere. They just said use same size for every trade. Not how my strategy works…… If you are a follower do your OWN analysis and not to rely on what is there as a given. So i have a good strategy that works and i want to ask if someone knows how much the trader can make on zulutrade? Just around abouts. They say on ZT website a trader can make up to $1M a month. Is that real?? I dont have much of my own cash to trade on so want to earn something first. It all depends on you strategy how good it is and what kind of risk you are using. I publish a few of my trade signal on ZT. If you have a good low risk low DD strategy you can surely make a few thousand a month. I never heard of anyone earning those huge amounts they show on the website though. Im doubt that is possible. The profit on ZT comes from the quantity of trades you do so if you do a lot of trades you make more commission but doing a lot of trades can put off your followers. Then there is drawdown. ZT now have a rule that if your strategy has a DD more than a % (i think 20%) it is invisible to EU followers because of stricter regulation. If your stategy is as great as you say you dont need zulutrade. Why not just trade it yourself? You can now open account with $10 just do a search. 19,763 pips after 13 WEEKS!!! It sounds like ZuluTrade might be a great place for a truly professional trader to provide signals. It could take a few years to build a following returning ‘only’ 20% or 30% ROI annually (with very low leverage) and a max draw down of -20 or -30% once every 5 years… but after people realize you are the real deal and won’t be losing their money they might start to think 20% a year sounds pretty good. It could be an alternative for a professional system trader who is not yet wealthy and who would love to start a hedge fund but can’t for whatever reason. I just opened a demo account 1:1 with 10K€ on Zulu and started following a couple of SP. I got no trades carried out so I went into a support chat. The guy on the other side told me that my leverage was too low and that I had to increase it, that most of their client use 500:1. I was appalled: at 500:1 a 0.2% fluctuation drains my position fully, and he was implicitly suggesting me to do that. A friend of mine, a professional trader for HNW clients, doesn’t trade over 5:1. The Zulu guy tried for a while to trick me into raising my leverage or increasing my working (demo) capital, but I stood my ground and he finally told me how to use the risk bar (risk bar? What’s that supposed to mean?) to tune the lot size. Also because of the flashy website, to me it looks like a massive videogame tricking people in investing money at horrible leverages. I use another mirror trading site, where the minimum required working capital for each SP is always well advertised – actually is the main parameter on the dashboard – and has no frills like the “risk bar” but more solid and consistent parameters. Since brokers makes money from commissions (and from often taking the other side of the trades), I wonder if a mirror trading site can have hire some SP – or making them up themselves – to trade on their system and attract traders. Any opinion on this? You are right. In professional asset management even leverage over 2:1 is seen as aggressive. When you look at the LTCM fund, the one that nearly broke the entire banking system back in ‘98, that was using average leverage 15:1. Not on FX but on junk bond arbitrage, but still the warnings are clear and we’ve written about it before on Forexop. Don’t know about other mirror trading sites but those where there are demo traders always have providers because it is a risk-free lottery. I know Zulutrade since 5 years. Use it for 2 years and leave it since 2 years. I had to big expectation. There was also some technical problem. Since then the Zulu improve a lot. maybe I will start again. Thank you very much for your brilliant article. I would add “Don’t Panic”. In my experience this is the worst thing that can happen. When you panic you can do the worst thing like adding manual trades to balance losses or to try to recover increasing your lots. The result is that you usually get burnt. Great article, Mr. Connell! Could you please advise on how to get in contact with you? I browsed through the website, however, failed to find any contact details whatsoever. Sure, there’s a contact form right here bottom right corner. The only sure way to make money in the long haul is to learn to trade yourself. Work on your own strategy. Relying on others is path to sorrow. 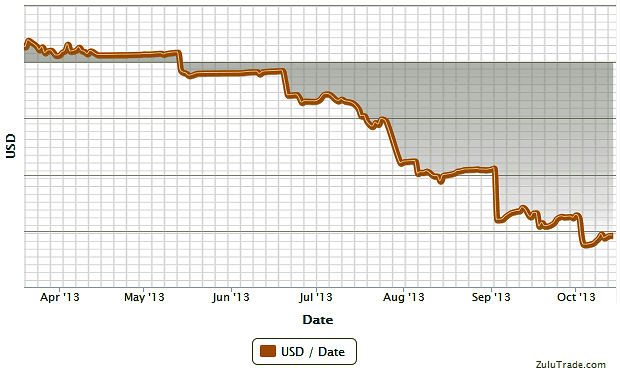 Been an SP on zulutrade for nearly 12 months now. I am trading manually using fundamental and technical forecasts to place my trades. I’m not using any robots. Have reached close to the top before a few occasions. As a responsible broker what Zulu should be doing is put in a way for the SP to reject followers from investing with them. Some of my followers have far too low account balance to follow my trades. Even when using the smallest lot size setting. The advised minimum balance is shown on my strategy page but they ignore it. An automatic block in place to disallow people who’re using too high leverage would be responsible in my opinion. This might seem unfair but these guys are the ones blaming me for blowing out their account and fill my wall with negative comments all the time! The SP is not allowed to reply to negative press only on his update section. The negative followers are in the minority but always have the loudest voices. That is what the new follower looks at when they decide to invest or not so better not to have them at all. 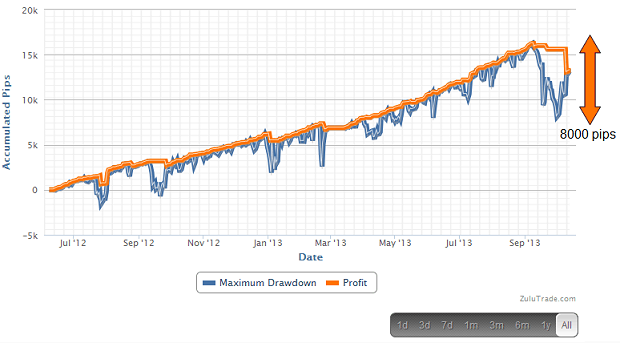 You’re totally wrong that you can multiply the max drawdown by 2 and be very safe. I’ve had many SP’s get drawdown many times more than their max DD. its a complete wipeout. good for learning about forex but complete failure for making money. Yes of course any single SP can easily lose way more than 2x their historical drawdown. That rule applies only when you have a diversified group of providers. Which means their returns don’t have significant positive correlation. In this case the chance of them all suffering 2x max drawdown at exactly the same point in time would be extremely low. If your provider’s history is short it goes without saying they are an unknown quantity. A shorter history means more uncertainty in the analysis. In either case these are only rules of thumb to give you an idea of the potential worst cases with your set of providers. Nothing is absolutely certain and nothing can keep you completely safe from losses. Hello Steve. An interesting observation that brought me to this page. 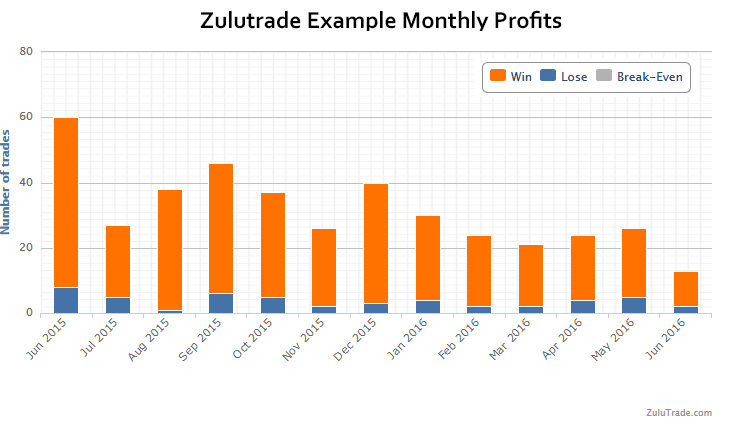 The losses reflected on my Zulu trade demo account are not reflected on the trader’s Trading History. My demo account was $4,100 in the morning, now its $3,265, but checking out the traders in the evening, they are top 10 ranking and their accounts don’t reflect the losses I have on my demo account with real timestamps. So I began doing a search on Zulu trade because I was wondering, if the 4 traders I’ve connected to are scoring 100% in their daily profile, then exactly how did the fall from 4,100 to 3,265 happen? My real account also has the same problem. Losses in my account are not reflecting in the trader’s profile. I am stunned! Thanks for your article. You’ve saved me loads of cash. Making money on there is definitely not easy. I also don’t like it that SPs can make money from demo accounts which are not real but make simulated profits. Having them earn on every lot also isn’t a great idea for the followers. Right now it is too much of a good thing for the SP and not so good when you follow their trades. If they got their act together I would trust it more.